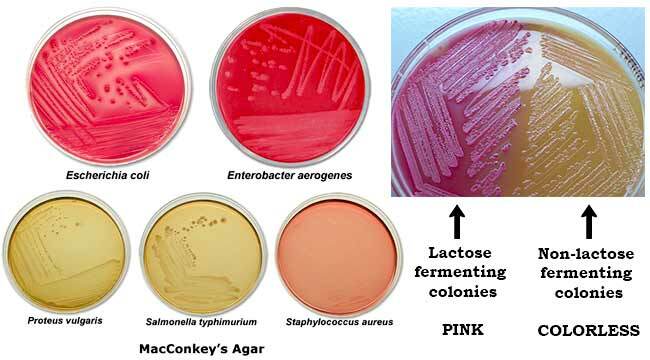 Final pH 7.1 +/- 0.2 at 25 degrees C.
MacConkey agar is used for the isolation of gram-negative enteric bacteria and the differentiation of lactose fermenting from lactose non-fermenting gram-negative bacteria. Pancreatic digest of gelatin and peptones (meat and casein) provide the essential nutrients, vitamins and nitrogenous factors required for growth of microorganisms. Lactose monohydrate is the fermentable source of carbohydrate. The selective action of this medium is attributed to crystal violet and bile salts, which are inhibitory to most species of gram-positive bacteria. Sodium chloride maintains the osmotic balance in the medium. Neutral red is a pH indicator that turns red at a pH below 6.8 and is colorless at any pH greater than 6.8. Agar is the solidifying agent. It is used for the isolation of coliforms and intestinal pathogens in water, dairy products and biological specimens. Suspend 49.53 grams of dehydrated medium in 1000 ml purified/distilled water. Lactose fermenting strains grow as red or pink and may be surrounded by a zone of acid precipitated bile. The red colour is due to production of acid from lactose, absorption of neutral red and a subsequent colour change of the dye when the pH of medium falls below 6.8. Lactose non-fermenting strains, such as Shigella and Salmonella are colourless and transparent and typically do not alter appearance of the medium. Yersinia enterocolitica may appear as small, non-lactose fermenting colonies after incubation at room temperature. The colonial characteristics described give presumptive identification only of the isolated organisms. It is necessary to subculture and carry out confirmation tests for final identification. Bacteriological Analytical Manual, 8th Edition, Revision A, 1998. Collin County Community College District. Thank you sir for your excellent notes, it really guides me in the treatment plant where i’m working as a microbiologist in the lab. please did you have notes on other media, their composition, uses, preparation and their appearances /colour after culturing. If MAC is for non-fastidious Gram-negative bacilli, why would Enterococcus and Staphylococcus give a reaction on this medium? Shouldn’t they show no growth? It may be that Enterococcus and Staphylococcus ferment lactose, but wouldn’t the crystal violet and bile salts inhibit their growth? Just curious. I am samiksha working as a microbiologist in ferm we are using macconkeys agar for water pathogen testing some times we found some submerged precipitation like something but not grow when subculture, in macconkeys agar plate after 60 to 72 hrs of incubation at 30 to 35 degrees incubation. Please suggest . Asante sana (thank you much) for your post. Am a foods, nutrition & dietetics student currently on practicum in a dairy factory. Initially couldn’t understand this MacConkey that i encountered in the microbiology lab but now i can understand it’s uses. For this am thankful.